I am just going to have this be a commemorative poster rather than informational, so band name, venue and date will be included on the poster. 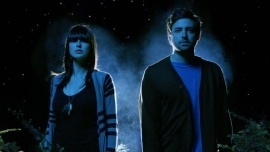 Phantogram is a two-person band that has what some call a "dream-pop" sound. According to Josh Carter (guitarist), their music has "lots of rhythms, swirling guitars, spacey keyboards, echoes, airy vocals". I watched a few of their music videos and pulled several themes that were consistent with each. Sarah Barthel (vocals) has black hair and wears all black, and has a sleek, glam overall appearance. The locations tend to be dark or take place at night. There is a dreamy/horror film quality to them. Along with the black and dark colors, they used a lot of red and blue, which I connected to the 80's and old tv's with the RGB color scheme. All of the visuals relate directly back to their name, which refers to optical illusions > 2D looking 3D > 2-person band sounding much more dimensional. There are a couple posters that I think represent them well, but a lot of them didn't make sense to me or seem to convey their sound very well. I pulled a couple poster images and a couple of their own promotional images and from a video shoot. I like the raw/dreamlike/80's tech (Tron) feel. These have a different style to show the range. Since I can't find that many posters for them, I don't see any symbols used obsessively. I also get from how they answer questions about their sound and their name that they would like some sort of cohesiveness and would like to represent their dimensionality through the poster that I am creating. I'm not exactly sure how the above relate quite yet, but I liked the overall sense of each of them. I love the one on the left, the center one has a sense of an alternate plane or universe, and the right mixes kaleidoscopes with the classic horror film poster feel. Love how uneasy these are, but still beautiful. The stars and the braille pattern is really interesting on top of them, and I was really thinking of using layering as a tool. 80's inspired film posters. I've seen the one on the right, and it totally fits the Roman Polanski film style. Also enjoyed the typography on both of these - uncomfortable but bold and fitting. Interesting textures. I always think the center image is the surface of the moon on first glance. 1: Image of the lead singer with the expression of Munch's The Scream with the night sky in the background, and text in a similar hand-drawn style as the horror film posters above. 2: Ornate oval frame imitating a mirror with the singer's silhouette in the center and the night sky reflected through her. I liked the idea of going off of Lewis Carroll's Through the Looking Glass as an entry to another world. 3: Typographic option with large sans-serif type in multiple neon/bright colors overlapping to create a kaleidoscopic effect. I'm more of a graphic designer than an illustrator, so I'm leaning more towards the last two, even though I really love the image I have in my head of the first one... I'll start exploring them more to help decide!